I am currently knitting two projects (not including those in the UFO pile), my Cove Cardigan, which has been on the needles far too long and a Slip stitch scarf. They are very different project with yarns of completely different weights and fibres. I knitted both this evening and whilst I enjoyed both, a realisation came to me. A light bulb moment if you like. I knit them in a different way. 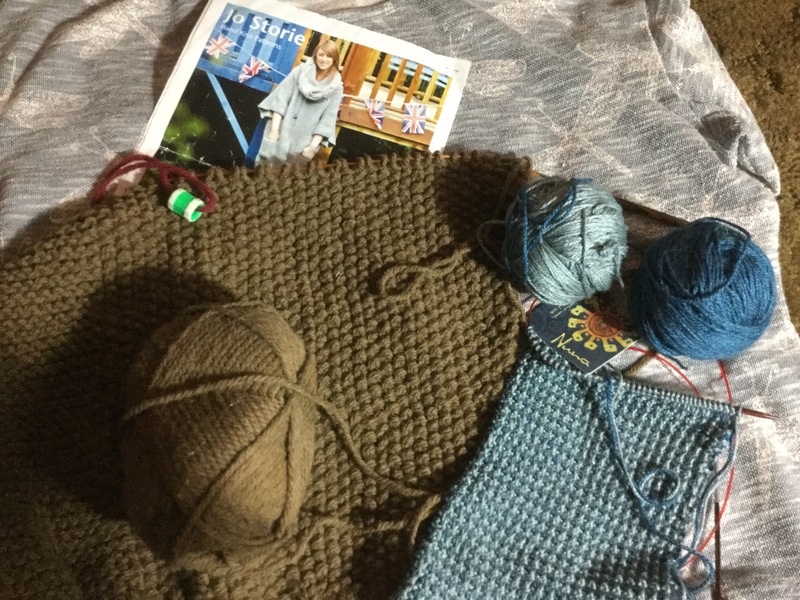 The cove Cardigan, I enjoy the first few rows and then whilst I still enjoy knitting it , it is more about getting finished and becomes a bit of a chore. The slip stitch scarf is a a soothing pattern to knit, I’m not sure if it’s the simpleness of the pattern or the yarn- Manos De Uruguay Nanu- or the thin needles. The slip stitch scarf is so relaxing and enjoyable to knit, I am definitely knitting this one for pleasure . My only concern is how long the yarn will last. It’s funny how different projects give you different experiences, both have wonderful yarns. For the Cove cardigan I am using the sadly discontinued Rowan British Sheep Breeds Chunky in a gorgeous undyed Shetland colour. The slip stitch scarf is knitted in a silk, merino bamboo blend. It is deliciously soft and smooth. 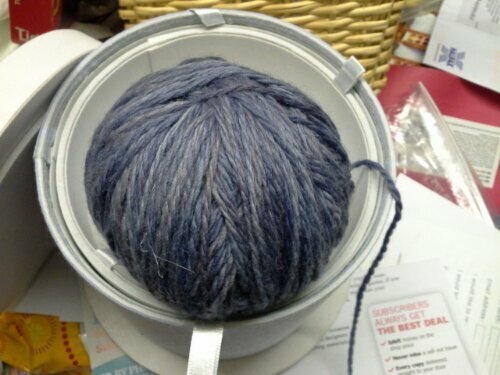 I am using a mid grey and deep blue. This pattern could be the one to use up all those skeins of sock yarn. It’s the first one they have put on but are hoping to make it an annual event. It reminded me of Knit Nation and I Knit but on a smaller scale. I was looking forward to it but also a little worried as it would involve lots of walking and standing. Luckily because of its location there were lots of spaces to sit down. I had my shopping list which consisted of needles and notions. I managed to get most of them apart from the DPNs I wanted. I need them to finish zahras coat. I know I could do magic loop but I would rather use DPNs. Among the fabulous stall holders of lots of independent yarn sellers was Jane Crowfoot showing her gorgeous crochet club blankets from previous years and selling her books and kits. I had thought of it I would have taken some photos but I was too over whelmed with all the lucious yarn and the riot of wonderful colours. We were both very good and didn’t buy much. I bought a sock making kit from http://www.etsy.com/shop/RosiesMoments?ref=pr_shop_more. 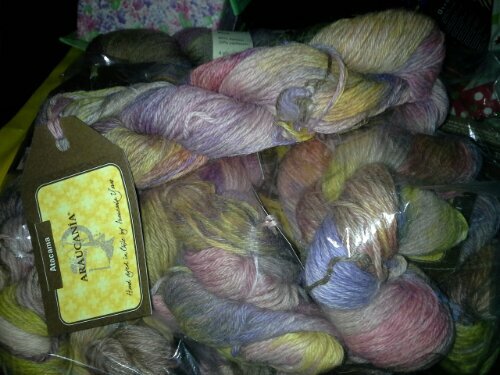 It was fantastic value, ten pounds for a skein of aran yarn, DPNs and a pattern. She said we could knit a pair in two nights so I figured that could get my stash down. I searched out Jane Lithgow http://www.janesprobablyknitting.blogspot.co.uk/ where I bought an amazing mitten pattern that covers all yarn weights and every possible hand size you couldneed. I love mittens and the beauty of this pattern is that as well as the range it covers you could easily add a pattern to the main hand as well. This was a bargain at £2.50 for the amount of work that must have gone into this. My next purchase was from http://yarngarden.co.uk/. 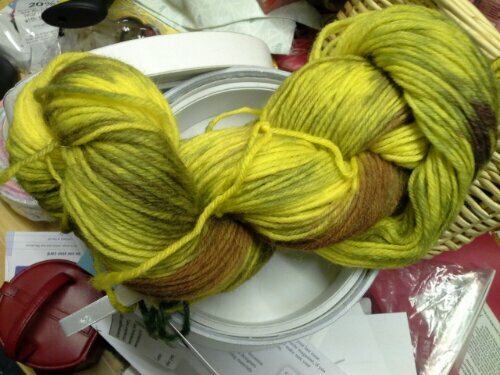 I hadn’t planned on buying any more yarn but I picked up a skein and it was called creeping Jenny variegated. Well as Donna said it’s got your name on it you have to buy it. The yarns that this couple hand dyes are amazing. When we went to luch we invited Louise to sit with us and she has some really exciting things happening shortly. I also purchased a book from her that I had been after for a little while.one skein lace knits. Her books are very reasonably priced as were her yarns as well as being so scrumptious. I expect to hear a lot more from her in the future. 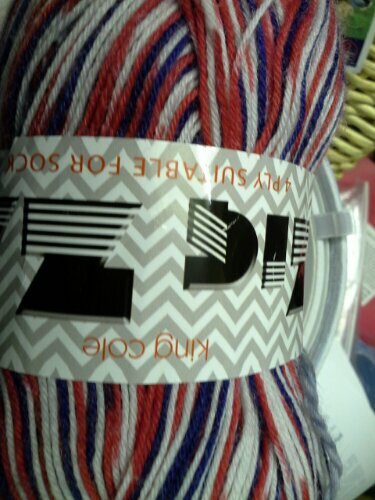 My final yarn purchase was from the crochet chain and was a ball of King Coles Zig Zag yarn. This was only £3 and I only Bought it because of the colours. Red, white and blue. I said it would be good for swaps but if I’m honest it was the colours. I still haven’t started the aran socks yet as I’ve been concentrating on Ysoldas MKAL , Zahras coat and my first batch of Mystery Blanket squares. I am not allowing myself to start another project unless I am up to date on my MB squares and MKAL. 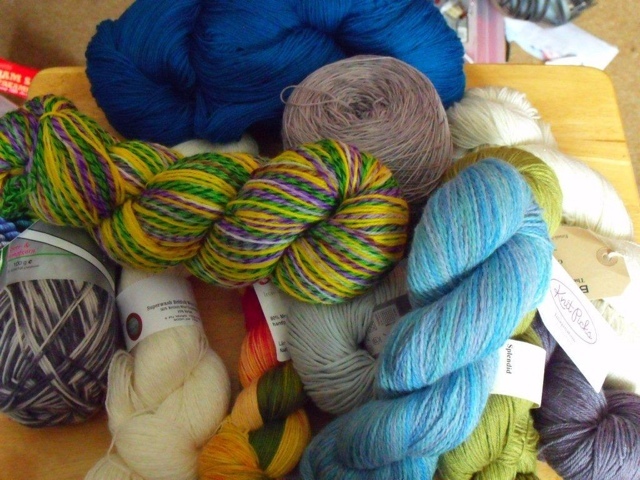 Even with these purchases I have still got rid of a lot more yarn than I’ve brought in. I have a large stash. No that’s not right I have a few large stashes. Fabric, yarn, buttons, embroidery they are all there. 2014 is the year I get these stashes down. I know it’s been said before but if I can’t make your present you’re not getting one. I aim to make my Christmas presents early log them on Ravelry with a note about the secret safe place I have hidden them. If I see a project I want to make, if I haven’t got the materials needed I can’t make it. My Christmas list for 2014 is already written with the age children will be beside their name. I also aim to sell a large amount of my stash off. I will be giving friends first option but the other bits I don’t like or am never likely to use will be sold. I have written a list of all the yarns I want to keep which is probably a little longer than it should be. I want to keep all my non acrylic lace, 4ply, DK and Aran weight balls and anything with Alpaca. I also want to keep a lot of my good quality sock yarns and all my Rowan Felted Tweed, Cotton Glace, Hand knit Cotton, Wool Cotton, Big Wool and Pure Wool. 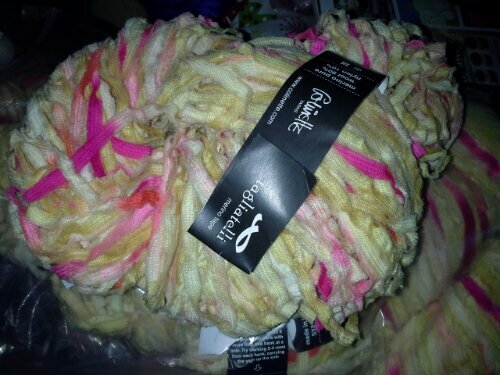 I will be selling all my acrylic, novelty yarns, bulky yarns and what I call stranded cottons. Ranges like Sirdar soft cotton or Rowan Milk Cotton which looks as if you could pull it apart for embroidery. I plan to sew my way through at least one 35 litre box of fabric and will probably be making little girls dresses in sizes that are too big for them. Last year in Liberty I bought a knicker making kit which I am eager to try to make some for my daughter. The fabric that comes with it is quilting cotton and a little stiff for my liking but I will use this for the first pair and then use Liberty Tana Cotton for the rest. Watch this space to see how I do. Yesterday my friend Donna came around with two huge bags of yarn. I should say no I can’t take it but I just can’t do it. There is a huge variety of gorgeous yarns and novelty yarns, brands I haven’t tried and some I have. My particular favourites in this batch are some Arucania alpaca yarn in pinks and browns, The knitting goddess sock club blanket yarn as well as some Collinette which is 10 years old. We both talked about how sometimes we both think it would be nice not to have a stash and just see a project buy the yarn and knit it . Obviously our habits aren’t going to change regardless of how much we think it would be better for us. I am good though with any yarn or fabric I am given I go through it all, choose what I will use and then give to friends, my knit group or nursing homes. I say I will use, I didn’t say when! It’s been a busy few months. One might even use the word hectic. I’ve done lots of crafting, been on a mini holiday, caught up with friends and family and lots of work. There’s also been lots of time spent with my wonderful grandson who is becoming even more of a character. Sewing seems to have the main craft over the last few months although I still got lots of knitting done. 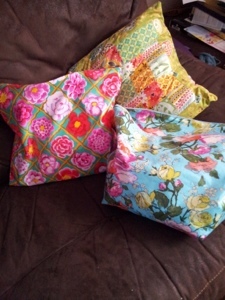 Although I have made lots from my stash I have made a few bits for work which I used new fabric for. I made some project bags from the gorgeous Rowan laminate. My favourite is the blue one which is an Amy Butler Alchemy design,there is a matching cotton fabric so I used this to line my project bag. It’s not like standard oilcloth it is much softer and as it is designed for sewing it goes through the machine easily and is soft. I really enjoyed making them the only problem was that I ended up buying some to make presents with. 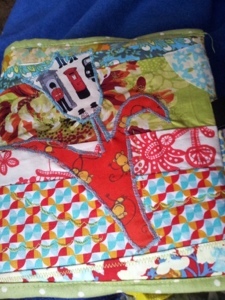 I normally think too much about the placement of pieces so this free form patchwork was a nice change. Yesterday I had a fantastic time at Knit Nation. Stashbusting went out the window and more luscious yarn was purchased. I did get almost everything on my shopping list and of course a bit more. There was only one yarn on my shopping list and ironically it’s the only thing on my list I didn’t get. It was mainly needles as I need to get another sock circular in various sizes and a couple of pairs of tips for my Knit Pro. I needed a 9mm and 10 mm tip but as they are sizes I don’t use a great deal I decided to try the Spectrum points which I bought from www.kraftykoala.co.uk. At www.brownberryyarns.co.uk I bought all my Hiya Hiya mini circulars. There were about seven sizes I needed and later in the day when I got fed up with losing stitches off my DPNs I went back and bought a 40cm circular to continue knitting it. I was going to take my Mystery Cushion knitting but decided to take a couple of small items I wouldn’t have to think about. I knitted the Snowflake hat from Making magazine except for the swiss darning and a small purse from Knitting magazine. Coincidentally both projects I took with me were designed by Erika Knight.